Unfortunatley, this Lucuma died in September the year this picture was taken. I gave a moderate dose of chemical fertilizer to a lemon tree that was near it and all of the lucuma's leaves dried up and fell off within days. I still believe it is a viable plant for the Phoenix area, but one must be very patient and careful with it. If anyone has a lucuma that produces in the Phoenix area, let me know about it. I'd like to pay you a visit and write about it. I also might try growing it again in the future. The advice given below in this article is still accurate. The small Lucuma tree on the right was photographed in late June, and it is about 2 feet tall. 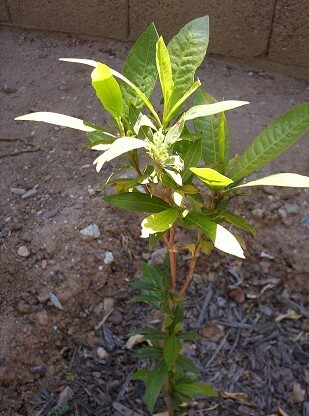 It was planted in early spring of the previous year, and originally grown from seed that came from Peru. I originally had two of these trees but the first one I planted died when temperatures went down to 26 F. in January of 2007. The plant was only pencil thin when it froze so perhaps if it had been larger it would have survived this extraordinary Phoenix weather. Lucumas are from the highlands of Peru and are theoretically hardy into the mid 20's F.
This lucuma tree is growing on the north side of a 6 foot block wall (4 ft. away) and on the east side of a large lemon tree at its drip line (4 ft. away), so it receives afternoon shade and protection from hot southern exposure. This tree has been very slow growing and appears to be very sensitive to being over fertilized. Even fish emulsion seems to burn it, so I currently give it only water and sprinkle some composted mulch around its base. Notice that a lucuma trees leaves are shiny and similar to gardenia leaves but thinner, which makes them a very attractive plant. Lucuma trees are native to the highland tropics of the Andes mountains in South America. The climate in this region is very mild with high temperatures ranging from 60 to 80 degrees Fahrenheit year round. There are large differences between day and night temperatures in this area, which can often change as much as 30 degrees F. in one day. Light frosts do occur but are rare. This region also has a pronounced dry and wet season. Interestingly, the winter in Phoenix is very similar to the dry season in the lucuma's home range. Summers on the other hand are quite foreign for it. These similarities and differences make the lucuma an interesting experiment here. Given the right micro climate lucumas definitely survive and grow in Phoenix but whether they will produce good fruit is still a mystery. Lucuma fruits are very unusual. They resemble a large green acorn, without the cap, and have a dry powdery orange flesh on the inside. See the L. Designs link at the bottom of this page for a picture. The flavor of a fresh lucuma is an acquired taste, but most people find it pleasant in small amounts. For me it is similar to a tangy pumpkin pie or a candied yam. Where the lucuma really shines is when it is mixed with milk products, such as shakes, ice creams, and yogurt. In fact, there is a very large world market for dehydrated lucuma powder and it is a popular ice cream flavor in Europe. Lucuma trees need afternoon shade in the summer. Even with shade they show signs of heat stress , such as leaf tip burn, in particularly hot dry conditions. Being hardy to the mid 20's F., frost damage should not be much of a concern in the Phoenix metropolitan area. However, very small lucuma trees can be killed by temperatures below freezing. Dig a hole at least twice the size of the rootball. At a minimum, make the hole 2 feet in diameter and 2 feet deep. Work in a 30/70 mix of compost to soil. Be sure to mix the compost and soil as thoroughly as possible. It also is a good idea to finish with the hole an inch or two recessed so that a watering basin is formed. Lucumas do well on a grass watering schedule. No nitrogen fertilizers of any kind, chemical or organic, should be applied to this tree because it is slow growing and very sensitive.